Sometimes it’s hard to accept life; to feel it’s pain, and see it’s turmoil. I don’t understand how such an evil can posses someone. You see it throughout history; the Assyrians, the Babylonians, the Nazis, the members of ISIS. There are too many to count, yet so little to do to fight. Why do we have to live in this world full of suffering and death? Why am I here in my cozy home when twenty-one Egyptian Christians were beheaded on a beach in Libya for saying no to denouncing Christ? Why am I here in my cozy home when the people of Paris live in terror after the murder of Charlie Hebdo? Why must I be safe and comfy and blessed when millions of women and girls my age are sold to men who will abuse them and hurt them? Why? Because the darkness is attractive and nice. It brings a curiosity to our wicked hearts and we just want to touch it. The same evil of adultery is the same evil that martyred those twenty-one men. The same evil of lying behind my parents back is the same evil that murdered Charlie Hebdo and terrorized the people of Paris. Yes, there is no difference between cheating than there is stealing, lying, committing adultery, murdering, fornicating, or any kind of sin. Any. When I walk into a Hindu temple for example, I am to be honest, disgusted, but also intrigued by the guy on the wall with 20 arms, blue skin, and a snake around his neck. Or if I see a woman with a low shirt and short shorts, I get a sick feeling, but also wonder to myself,”I wonder what it’s like to wear something like that?” You feel disgusted and intrigued at the same time. Just dib-dabbling into a bit of darkness gives us the opportunity to become just like ISIS, a Nazi, a terrorist, a communist, an abusive person, a drunkard, an adulterer, or even a murderer. Just because we are redeemed by Christ doesn’t mean we are perfect. We are still human and sin is still in the world. However, just touch the darkness and see how much will stay with you. The heart is deceitful an desperately wicked: who can know it? You are human and there is nothing you can do about it! You are not in heaven yet, you are making the journey to heaven, but until you get there, you will never ever be the perfect person you want to be. Of course you can try, but you’ll never get there! A lot of people will make a big mistake and just say,”Ah, shoot! Well I’m human and I’m not perfect.” This is called sloppy grace; when someone keeps messing up and asks forgiveness but never tries to stop his/her wrong doing. 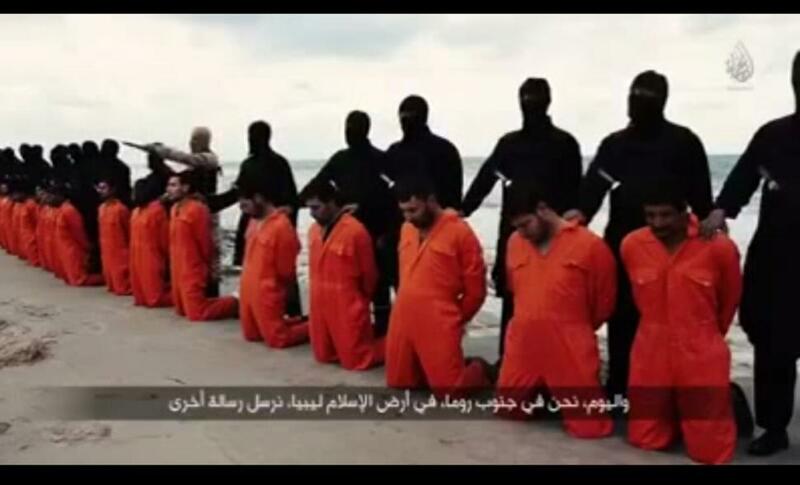 I am grieved that twenty-one of our brothers were beheaded for our Lord. I am angry, sad, weepy, and helpless that I can’t do anything accept pray (that is however the best thing). I have realized however how blessed I truly am by it and I think I am forever changed. I am here in my perfect bubble life and am safe. It’s not fair, right? But, that is what I was called to do (for now, anyway). My life is abundantly blessed by God, therefore I must enjoy it onto the glory of God! Live my life like it says in Ecclesiastes for my Lord! Enjoy the blessings Christ has given me for His kingdom. Ride that horse, play that game, watch that movie, hear that music, sing that song, dance that dance, run that race with joy until the end for the glory of Christ, God’s way. Why am I blessed? Because the Father wanted it for me. That’s why. So, I think that is all I have to say, I would love to say more, but, math is waiting. Good day my fellow peeps and enjoy life and flee the danger. I would say that this is another discovery in an over-sized lime green moon chair, but it was a talk at the dinner table and written in an OSLGMC (over sized lime green moon chair 😀 ).